Corrie Ten Boom said, "Never be afraid to trust an unknown future to a known God." That couldn't be more true for David and me right now because, this past Wednesday, David unexpectedly lost his job. So, we definitely have an unknown future, but that's okay. We are choosing to put our TRUST in a KNOWN GOD who loves us and has promised to provide for our needs. Sometimes, trusting an unknown future to a known God is easier said than done. 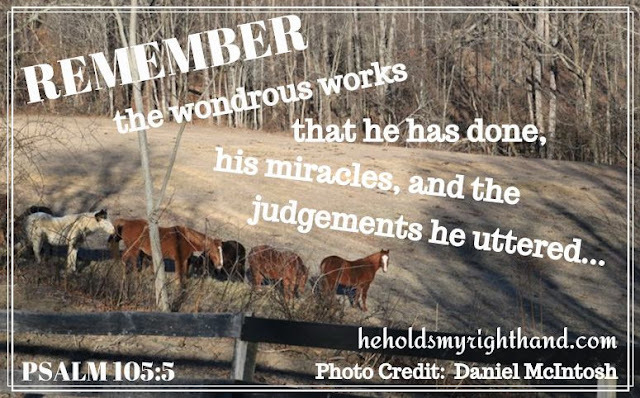 But, one way I have found to help me do that is to reminisce about the past, focusing on the wondrous works the Lord has done in my life. ~ I have good memories of times that have worked out well for me and my family, and of how God has provided for our needs. ~ I also have memories of difficult times that may not have turned out how I would have liked; but I knew the Lord was with me, holding my hand, giving me the strength I needed. When I remember past circumstances, no matter what the outcome was, it helps me focus on the goodness of the Lord. That, in turn, helps to calm my fears of an unknown future, and helps me to TRUST the Lord more. A suggestion to help you remember all the things the Lord has done for YOU (or brought you through), is to start keeping a prayer journal. My mother taught me to do that, and it really helps. It doesn't have to be fancy. Just get a simple notebook and write down your prayer requests and the date, then leave a little room to write down the answers/outcomes when they come. The more you look back and recognize His goodness in your life, the more you will be able to TRUST in Him. So, start one today, if you haven't already! TRUST our God with your present and future because of how He has helped you in the past.